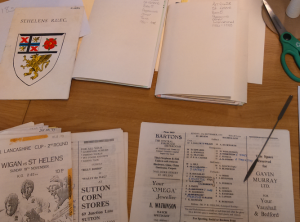 There have been four separate deposits that make up the Liverpool St Helens archive. Since February 2017 I have been listing and repackaging material from Accession 6428, which consists of 36 boxes. Throughout March I have been working with match day programmes. For the Liverpool St Helens era of the club this amounted to 11 boxes of programmes. My first task was to see if they had been arranged in a particular way. Several boxes had programmes organised in date order with the date written in the top corner. Almost all of the programmes had been placed in plastic wallets. A number of the programmes contain handwritten notes; these record last minute team line-up changes, and half time and full time scores, along with who scored the points. I think these notes give a fuller picture of the match. Next, I removed the programmes from the wallets and sorted them into ‘Home’, ‘Away’ and ‘Other’, following how other sporting club archives have been arranged. The ‘Other’ category is for national cup competitions, international matches, county and district matches, schools and youth teams, testimonials, charity games, sevens and other games that fall outside the normal fixtures. Any duplicate programmes were removed. Due to limits on space Liverpool Record Office will not store more than two copies of any document. I made the decision to keep one copy secure in the archive and store duplicate programmes in a separate box. The duplicate programmes can be used in outreach work with schools and community groups as well as for exhibitions. I feel it is important to have items that can be handled as it brings the archive to life. My next task was to remove the staples from each programme, as these can rust and damage the paper. 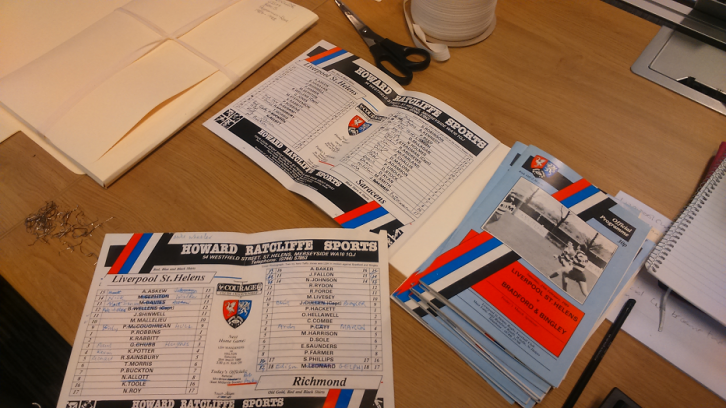 The ‘Home’ and ‘Away’ programmes were arranged by season and wrapped in acid free paper to preserve them. These bundles are then put in acid free folders and tied with cotton tape, again to minimise any future damage. The most time consuming task is working with the ‘Other’ programmes. Here I have had to learn about national cups and trophies and their changing names and sponsors. For example the John Player Special Cup became the Pilkington Cup in 1989 and later changed to the Tetley Cup in 1998, just 3 years later there was another change of sponsor to the Powergen Cup. From 2005 the Anglo Welsh Cup was in existence along with changes to entry requirements relating to teams from the Premiership and Championship. The following year a new sponsor, EDF Energy, was found until 2010, when LV took over. Thankfully, I was able to piece all this information together with the help of the internet! Additionally, I have used fixture lists to record which programmes are in the archive. Here I can identify gaps and hopefully, in the future, with the help of members and supporters find the missing programmes to ensure the whole season is preserved for the future. By the time this activity has been completed there will be six boxes of programmes with one box of duplicates.